After changing the way many people watch television, by pioneering time shifting, season passes and the ability to pause live TV, TiVo has become synonymous with scheduled television recording, even under intense competitive pressures from cable provider clones. In recent years, TiVo's standard-bearer hardware boxes have evolved to include ever-larger hard disks, integration with wireless networking, avoiding pokey phone line schedule updates, and more additions to the machines' playlist - adding on music, photos and on demand videos from partners. Today, the company introduced a new top of the line product family with its Premiere and Premiere XL boxes, aiming to make the DVR the central entertainment box for your living room - including not just cable TV, but movies, Web content and music as well. Alongside the announcement, the company also introduced a new take on their trademark remote - with an integrated keyboard, as well as new partnerships with Pandora and FrameChannel. TiVo's aggressive marketing materials call the new Premiere and Premiere XL DVRs "the one box to rule them all". The reason for the new messaging? A focus on integrating all these entertainment sources into one package, with improved discovery. As important to TiVo as the new boxes' 320 gigabytes of space for Premiere or a full terabyte for the XL model is a revamped search functionality that lets viewers find content from many sources at once - be they on cable, the Web or from partners. 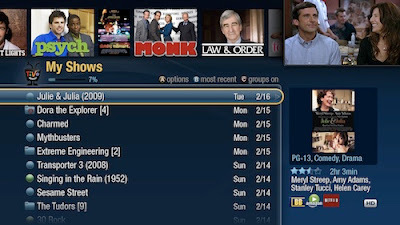 For the last few months, TiVo has been running a search beta for its customers, and it looks like they have been watching the activity, as the new search shows the highly graphical interface, previously only accessible through their beta trial, including poster-like images for related programs, and hooks to BlockBuster, Amazon and Netflix. 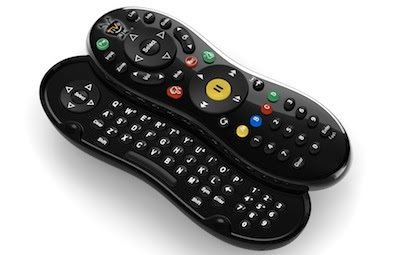 Searching the new Premiere line becomes even faster when one has access to the new remote control, which, when turned sideways, slides out to reveal a QWERTY keyboard, greatly easing the ability to type onto the screen. Beyond basic search, TiVo is talking up its directory of programming and artists - saying you can now view actors' entertainment resumes and show's cast lists, much like an on-demand IMDB. TiVo also promised you wouldn't need to be constantly changing screens from menu to menu, moving to a more simplified UI, with double and even triple columns, built for today's larger HD sets. Also announced today was a tie-in with Pandora, the popular music streaming service, letting you listen to your personalized radio stations through your TV set. This news not only is available to the Premiere line, but also to existing Series 3 and HD line customers, which means our home could tap into our music on the HD and XL boxes we have. While announced today, Pandora doesn't go live for a few months. Interestingly, also debuting today is a relationship with FrameChannel, which promises to "bring the best of the Web directly to the TV, offering users access to nearly 1,000 content widgets of personal and commercial content, ranging from Tweets, photos and status updates to news, weather, sports scores and stock quotes." 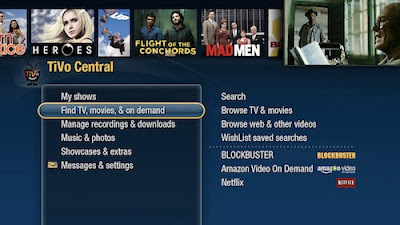 The FrameChannel tie-in is highlighted as your own personalized channel, much like a browser start page or PointCast from the late 1990s, but on your TV. The new Premiere line carries on the TiVo tradition of getting ever thinner and more sleek from generation to generation, despite increased hard drive capacities. Also new to Premiere is an on-screen disk space meter to show how many more shows you can record, and a built-in 30 second scan, which no doubt makes it even easier to skip commercials. The new TiVo lineup is available in a month's time - debuting in early April. The standard Premiere model is $299 and the XL is $499.